Which are better, claws or guns? Find out in this brutal collection of Wolverine/Punisher fights - and grudging team-ups! From their first throwdown in the heart of Africa, there's no love lost between two stone-cold killers whose combined body count is off the charts! They'll take on the Punisher's cyborg doppelganger Damage, go to war with the Architect, and head underground for a revelatory mission! They'll rumble in the jungle, melee in Madripoor and literally battle a small army! But nothing can top the sublime violence Garth Ennis's Punisher visits on his sparring partner - except maybe Logan's swift revenge! Snikt! Snikt! Bang! Bang! 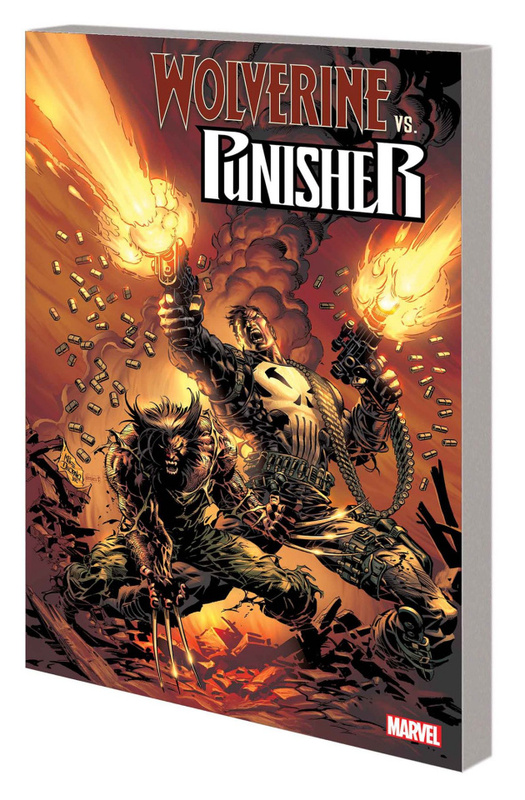 Collecting PUNISHER WAR JOURNAL (1988) #6-7, WOLVERINE/PUNISHER: DAMAGING EVIDENCE #1-3, PUNISHER WAR ZONE (1992) #19, WOLVERINE/PUNISHER: REVELATION #1-4, PUNISHER (2001) #16-17, WOLVERINE (1988) #186, WOLVERINE/PUNISHER #1-5 and ASTONISHING TALES: WOLVERINE/PUNISHER #1-6.